What is a personal injury claim*? Personal injury is a broad term which covers any type of harm caused to an individual as opposed to damage to property or business. It can cover both physical and mental or emotional harm. From a legal point of view, it refers to cases where an individual or organisation can be shown to be responsible for causing the injury. The amount paid out following a successful claim depends on a number of different factors. It is only when your lawyer has the whole picture that they can suggest what would be an appropriate of compensation for the claim. Some common scenarios that lead to personal injury claims* include car accidents and accidents at work as well as injury caused by faulty products such as badly designed children toys or flammable clothing. County or city councils may be held responsible for accidents in public places for example if loose paving stones or faulty banisters cause a member of the public to trip or fall. You could even possible claim for an injury while playing golf. How much is my claim worth*? There are a lot of different factors which need to be taken into account to decide how much the claim should be. A lawyer would usually start by considering the extent of any physical and/or psychological harm. In some cases, there is no physical harm but the long term effect of an accident can lead to post-traumatic stress disorder. Compensation may be awarded to cover the claimant’s emotional distress. The amount of the award should also take into account other factors which resulted from the injury. As well as suffering pain and distress there may be financial consequences caused by personal injury*. You may have had to take time off work or in more serious cases have had to give up your job altogether. In such cases, loss of earnings as well as loss of potential earning will be taken into account when deciding the figure. You might also have had to pay additional medical costs such as counselling or private physiotherapy. In addition to compensation based on the claimant’s suffering and losses, the court may decide to award punitive damages. This is an additional amount added if the court feels that the defendant deserves to be punished or as a deterrent to encourage the defendant to change their behaviour in the future. Many lawyers take on personal liability cases on a no win no fee basis although advertising this fact is not allowed within the laws. This may be something you want to consider and if so you should discuss it with your lawyer. If they agree that this is the best way to proceed, then they will only charge you a fee if you win your case. Personal injury claims* are complex with many factors to be taken into account. Early on it is advisable to discuss all aspects of your claim with a lawyer who is experienced in this field. 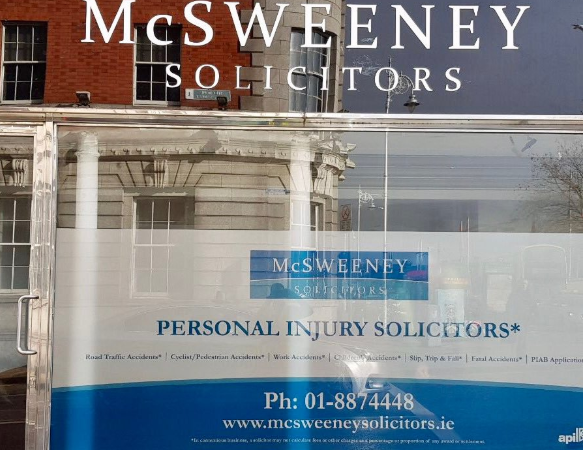 At McSweeney Personal Injury Solicitors, our clients can benefit from years of professional experience in this area and we will always be happy to discuss all the relevant factors to help you make the best decision.